It’s one of those albums that dropped like “boom”. Let’s say like Kamikaze. Eminem waking up one time and announcing on Twitter his album is ready. Of course Samini did carry out some form of publicity ahead of the d-day but 12 months, 6 months or 6 weeks to the launch and even listening session not many except perhaps those who are close to the musician had an idea that an album was in the offing. That unique voice many have grown used to is heard screaming “y3 y3 ohh, yaga yohhh, yaaah“ and proceeds to ask the listener to guess who is back on the track, one cannot help but know there is something coming up that requires applause like he goes on to say. 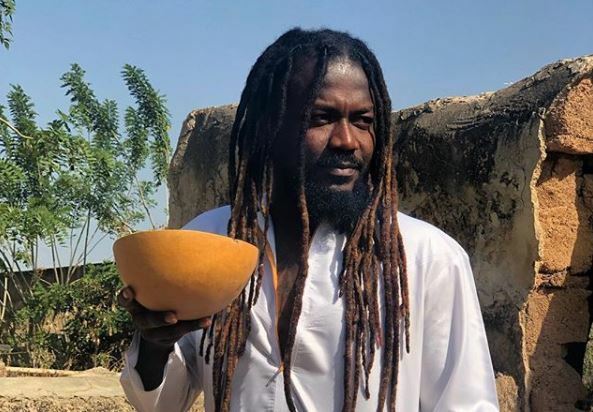 Samini knows his place in the music space; he has been tagged as an old horse, riding on past glories aside from being incapable of gaining the top spot he held on to years back. He admits to some of these facts but states. “Rain goes away just to come another day” This is a defining moment in the song. Samini is different from his contemporaries whom he started with. Many have tried to return and have simply failed. He has been around he reminds all, he does go low sometimes but he belongs to the charts he argues and is ready to take it once again. Samini sings about sweet music that plays and takes someone away. It reminds me of what Bob Marley wrote about music hitting you. Music is indeed powerful, soothing and a great companion for many who are distressed. Samini in this song informs his listeners that he has a grasp of what music and his music for that matter achieves hence the line. “Jam and forget about your problems...” samini certainly maintains the score of 7. A score of 8 is fair for rainbow and natty dread. He abandons love and switches to hard realities of life. Of course love is often part of such realities and so certainly features in this story. Except one “Ba Yaa Getty” is the recipient of the affection not coming Samini but from his homie Kwesi who embezzles “dough” meant to build journeyman Samini a home. The singer is now alone, wants to go to town but is left alone. Who to trust is certainly an important lesson the composer wants to put across. A lot of the times those who let us down tend to even avoid us after disappointing us and proceed to act normal. Samini captures all that. This song is terribly perfect and earns a score of 9. Has a good message and is a great great tune. “Obra” is my best pick on this 22 track master piece. “Worldwide” takes us back to the theme of the introduction tune. Samini talks about the fact that he is a warrior who doesn’t accept defeat, being here to stay, he is still up on his two legs, ready to take Ghana music worldwide, being betrayed by his own kind who can’t even get to to his level which you may well know by now; is high up. I will award this a 7 like the first track. Somini loves to boast like many acts. He continues to remind us once again he is the king with a regiment and the “Dada” for the girls. “I reign supreme”. “Raga Dada” earns 7. As you may well have noticed the trend by now, Samini returns to the theme of love once again in “falling”. He sings about this lady he loves so so much whom he wants to literally do a lot for. It appears the lady is not entirely convinced Samini is the man so Samini now throws out lines to show how much sacrifice he intends to make for the lady. Good love song worth a score of 7 just like “Craving” that comes right after that. The love Prof as usual is yearning for the love of another lady whom he doesn’t want to lose. It doesn’t appear he has won her over entirely so he tries to convince her not to leave him at any point. “Old man’s radio” which is the 12th track has quite a different theme. Samini preaches hard work, patience and living by grace. He chants!